Sequins, sunglasses, feathers, and floral crowns. This can only mean one thing, it's festival season! Grab the glitter, double up on denim, and tie-die your t-shirt. We're here to help you rock 2018's hottest looks, with discounts on the freshest festival fashion, as well as all the latest beauty looks, and must-have accessories. Don't miss out on a wonderful free gift for the little ones. Get more for your money with this lovely little gift. Grab a code, place an order and your freebie's in the bag! Redeem this voucher code to get free delivery on your big orders. Beat those April showers with bargains on quality clothing. Pick up everything you need for the new arrival and you'll get a little extra gift to welcome them to the world with this fantastic voucher code. Get your order delivered without any additional charges by redeeming this voucher code. Get your Summer wardrobe well underway with the aid of this money-saving voucher code. 25% off fashion, footwear & lingerie, min spend £100. Take advantage of this exclusive offer and get 30% off dresses and shoes! Get your purchased items delivered to your doorstep without any charge from this online merchant. Treat yourself with huge discounts on stylish clothing in the sale. Register by following this link for 25% off your first order which will be sent directly to your inbox. Great savings on this iconic brand when you register to the newsletter. Grab yourself a huge saving in the clearance sale. Save on style this season. Purchase the best collection of boots, jackets, backpacks and much more for a reduced price from this online store with this wonderful offer. Discover a wonderful assortment of sale styles which are heavily reduced. Those in education can get a fashionable reduction on their purchases when they register and verify status online. 1. The unique student discount code (“Discount”) applied for via this form is available to students currently enrolled on a college or university course in the UK, US, Germany, France, Australia, Italy, Spain, Austria, New Zealand, Hong Kong, Singapore, Denmark, Switzerland, Belgium, Netherlands and Republic of Ireland. 2. The Discount is valid for the duration of the college or university course for which the student has registered as part of the validation process. 3. In order to receive the Discount, you must register with ASOS and complete the validation process. 4. Once the validation process is complete, your Discount will be sent to you via email. 5. Redeem your Discount by entering the code in the Promo Code box during checkout. 6. Discount is valid on full priced items only. 7. Discount cannot be used in conjunction with any other offer. 8. Discount cannot be used on delivery charges, gift vouchers, ASOS Premier and ASOS Marketplace. 9. ASOS reserve the right to terminate the Discount without notice. 10. Discount is non-transferable and is valid only for the student who was sent the unique code. Should a unique student code be used by anyone other than the intended user, the Discount will be withdrawn without notice. 11. Discount can be used on orders up to a maximum total spend limit of £500 (or the equivalent in your local currency), after discount, per calendar month. 12. Some brand exclusions may apply. We've got the ticket to some of the best vouchers around, with money off a huge line-up of big name brands, such as ASOS, New Look, boohoo.com, Pretty Little Thing, Missguided and much more. 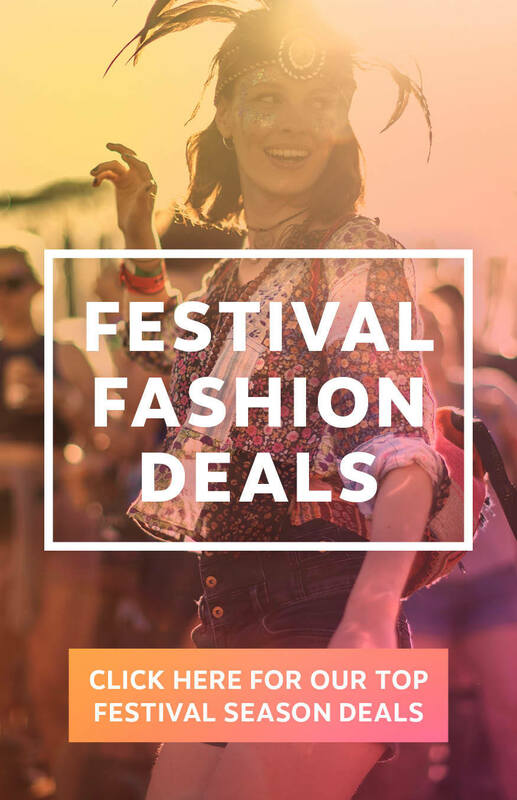 Finish off your look by snapping up a promo code on your essential festival staples, such Converse trainers, Hunter wellies, and RayBan shades. Whether you want to rock out at Reading, escape to Boomtown, look your best at Bestival, get a bit crazy at Creamfields, or let your hair down at Latitude, we have vouchers for all the must-have looks, with your outfit promising to be this year's main attraction. As well providing the look for plenty of #OOTD selfies and #nofilter snaps, our voucher codes mean you'll have some spending money left over, with more cash for burger vans, music programmes, merchandise and a pint of cider or two! Whatever your summer plans are, make it one worth singing about. Grab a discount code for some last-minute festival deals.